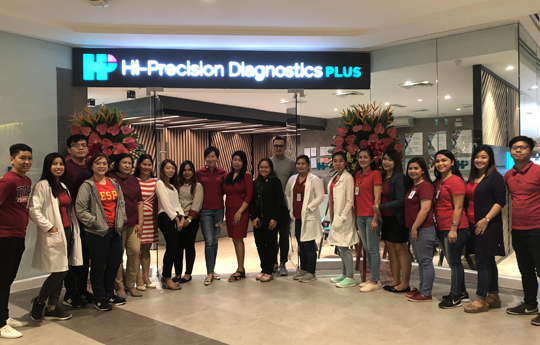 Hi-Precision Diagnostics (HPD) recently opened its 46th branch at the third floor of Ayala Malls Vertis North, Quezon City. Now, Metro Manila residents have more HPD branches to go to for high-quality laboratory tests using advanced medical technology and exemplary service at reasonable rates. Blood tests, drug testing, X-ray, ECG, and ultrasound are among the services offered at HPD Vertis. All ready to serve --- the Hi-Precision Diagnostics (HPD) Vertis North team and doctors with (9th from left) Melissa Ongsue-Lee, HPD VP for Sales and Marketing. With the opening of its Vertis branch, HPD is clearly showing no signs of slowing down in its mission to provide quality healthcare for everyone. The ISO certified medical diagnostic facility continues to be a pioneer in the industry by acquiring technologically-advanced machines and software to uphold the quality of its tests to be at par with international standards. Keeping its clients’ comfort and convenience in mind, HPD offers home service and mobile on-site services not only to individuals but also to a wide array of clientele that includes corporations from various industries. And for a gift of health right in time for the season, HPD’s Vertis North branch is offering a 10% discount on all laboratory tests (except imaging services and special tests) from now until Dec. 31, 2018. Call 0917-7071955 or 0933-8690061 for promo details. HPD Vertis North is open every Monday to Saturday, from 7am to 4pm. LAB Your Life this 2019!